Darlings, in the left corner savor the sauciness that is J. Crew’s magnificent Maritime Stripe-Blazer; in the right feast your eyes upon Forever 21’s fabulous Striped French Terry Blazer. While the Forever 21 piece is made up primarily of polyester, whereas the J. Crew gem is constructed entirely out of heavyweight slub cotton; for a mere $22.80, as opposed to the $118.00 necessary to take its Crew cousin home, it is the ideal way for the frugalista to add a smattering of sailor style to her wardrobe – at a price that allows one to scoop up both chic color combos (Cream/Black and Navy/White)! Thanks to J. Crew and Forever 21 for the pictures. I have had my eye on that J. Crew blazer... am going to have to splurge on this one! ME? Thrifty .... Thanks for the find, I love them both but definitely staying with the Forever 21. Definitely the Crew. I like the cut of this style, it just looks like an all around better fit. And I'd wear this jacket often, so I'd invest. Fabulous alternative, but I do so love the Crew smaller lapel, though I wouldn't love the weight for spring. what an awesome steal ! i love striped blazers ever since i first saw them on givenchy's show ! i love the forever 21 one. it's way too cute!! Honestly, I love the Forever 21 better! So cool from Forever 21. So love the Forever 21 lapel. The way I am with clothes. I better go the cheaper route. What a fabulous find! I am definitely onboard with the nautical theme this Spring Season. That Forever 21 alternative is a winner, for sure! Heck ya Forever 21 all the way!! My favorite is the J. Crew jacket. Great find! Yepp, yepp - love 'em! I never considered a stripped blazer but I love this!! Perfect for spring with jeans. the Maritime theme and horizontal stripes continue to be the rage. Great choices, Erika. I do prefer the JCrew option because of the slimmer lapel, which makes the jacket a bit more sophisticated looking. Depends on what a stylista is looking for. The F21 is great for a more casual look. Happy Thursday! Nautical and blazer in one? Heaven! JCrew for sure! I just think the cut is much more flattering. It's tough to pull off horizontal stripes, even more so if the item isn't fitted. I think the F21 jacket would makes you look wider! SO I'm going to have to 'splurge' and get the JCrew one! I like both, but I do prefer the slimmer lapel... it's a sleeker look. Another great post, Erika! Eeek! I am so getting this! I'm so glad that you find these Erika! I think the forever 21 could work if it was taken in a little, so I will have to check it out in the store and if it's not sewn crookedly (sometimes their stuff is) I may have to snag it. LOVE this one! cute! i can picture myself wearing this alot... i love the steal price! i love this segment u do because it makes me much less stressed about all i CANT afford ;-) and i know i can get things much cheaper, especially for how little i wear things! These are super cute -- love the F21 one! you really did a nice redo of this blog. love the j.crew blazer here. i can never get enough stripes..
Now that is one heck of a deal. A striped blazer is such a perfect piece to have. I love the J. Crew one. It looks like it fits so much better. I'm loving the F21 Blazer. Seriously, is it me, or did J.Crew get waaaaay more expensive overnight? I always feel beaten down when I come out of there...hahaha. ahhh I feel a strong need to order this, I'm going to give it a day and if I can't stop thinking about it them I will HAVE to get it. Thanks for sharing! i'd have to splurge and go with the j. crew one, it's gorgeous! Forever21 is so ridiculously cheap! I am careful with blazers now though... must be careful that the cut is flattering on you! I love the J.Crew one! Forever 21 all the way baby! Need I say? J Crew of course! The cut is sooo much better, and again, never F21 for me! They look the same to me! Awesome!! I'd have to go for the J. Crew version here. It looks classier to me for some reason. I just really like to buy the Forever 21 blazer, because it's looser than the J. Crew version and J. Crew really like to overprice their stuff. Hope you had a good Thursday. I'd have to splurge on the J. Crew blazer! Mainly because I have to be careful with polyester and cotton sounds amazing :) Great finds!! Have a great rest of the evening! I like the J. Crew one. I WISH i could afford it! Ugh J. Crew WHYYYY are you so far outside of my price range. I feel like I'd have to try them both on, and it would depend which one fit better. I've learned blazers are so fickle when it comes to actual fit! F21 takes the win for me! Oh my freaking gosh I am so in love with that F21 blazer I am seriously considering rearranging my schedule tomorrow so I can see if I can find it. oo nice work on this one! I'd definitely go cheaper- such a trend deserves the smaller price! Great comparison, but I think I like the collar on the Crew! This makes me want to get on a boat! Great post. You could wear that blazer so many options. I would be thrifty on this one! I'm still trying to muster up an inspiration to wear stripes... I probably had too much as a kid. I must be a terrible snob but I still like the Jcrew jacket more. maybe because I gave my heart away to jcrew a long time ago and now only have eyes for it. lol. Still a great find though- if I was in college still I would go for the Forever 21 jacket in a new york minute because its more budget friendly! Oh, Erika... I actually really love the J.Crew one. I'm going to have to splurge this time. And I will definitely be stopping by J.Crew to check it out in person! It looks perfect! 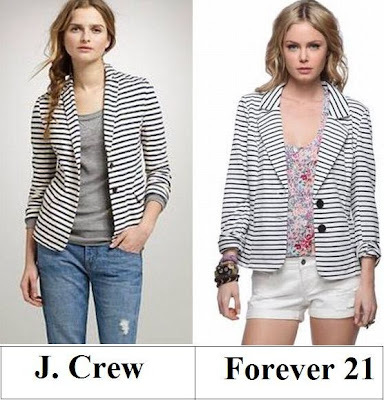 I would definitely purchase the F21 jacket as opposed to the J.Crew, it's just such a better deal and looks exactly the same! Who would ever know? And honestly if it's trendy and looks cute, paying less is not a problem. Strips seem to be in style during the winter/spring season, so they will probably be everywhere soon (if they aren't already)! Gotta be honest, I like the J.Crew one better in this case. The shape, the slim collar, the color . . . but I'd have to try them both on to really decide. Great find, and they're both really cute! I'm jumpin' on that F21 blazer! Love the style of this jacket!